Susan Rice’s trip to China shows that Washington and Beijing have different goals for the relationship. While China was celebrating the Mid-Autumn Festival on Monday, at least one Chinese official was hard at work: State Councilor Yang Jiechi, who acted as the host for U.S. National Security Advisor Susan Rice. Rice was in Beijing from September 7 to 9, her first visit to China since assuming her current position. Rice met with Yang as well as Chinese President Xi Jinping, Foreign Minister Wang Yi, and General Fan Changlong, vice chairman of China’s Central Military Commission. The main goal of Rice’s visit, as Zach noted previously, was to lay the groundwork for President Obama’s November visit to China. Obama will be attending the APEC leader’s summit in Beijing before taking part in an informal meeting with Xi Jinping, a follow-up to their 2013 meeting at Sunnylands in California. State Councilor Yang and Rice discussed the upcoming visit in their meeting, with Rice saying that Obama is looking forward to a chance to meeting with Xi again. Foreign Minister Wang Yi also emphasized the importance of Obama’s trip to China (only his second since taking office). “Both China and the U.S. should make sure Obama’s China tour is productive and sends a clear signal that the two countries are fully capable of working together to make the world more peaceful,” Wang told Rice. Throughout the meetings, both sides placed a heavy emphasis on the global implications of U.S.-China relations. Rice repeated the Obama administration’s position that the U.S.-China bilateral relationship is one of the most important in the world. Upon her arrival in Beijing, Rice tweeted, “Most major global challenges of [the] 21st century cannot be addressed effectively without U.S. and China working together,” a sentiment she also emphasized in her meetings. Rice said that Obama had asked her to visit China, despite a multitude of other issues on the global agenda, because of the priority Obama places on the U.S.-China relations. Rice and Yang listed the usual issues as areas for potential cooperation: economics, counter-terrorism, environmental protection, the Korean nuclear question, and security concerns in the Middle East and Afghanistan. Of course, the recent encounter between a U.S. surveillance aircraft and a Chinese fighter jet also colored Rice’s visit, particularly her meeting with General Fan Changlong. Beijing blamed U.S. surveillance missions for the incident, saying that the Chinese fighter pilot acted rightfully in intercepting the U.S. Navy aircraft. 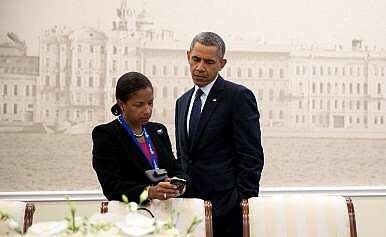 Accordingly, Fan told Rice that the U.S. military “should reduce and ultimately stop ‘close-in reconnaissance.’” Fan added that “we hope the U.S. can promote the healthy development of new China-U.S. military ties with concrete actions” — trying the reduction of surveillance operations to the future development of military relations. So far, that seems unlikely to happen. In recent comments made at the DC-based Carnegie Endowment for International Peace, U.S. Chief of Naval Operations Admiral Jonathan Greenert said that “there’s no intention that I’m aware of” to reduce the frequency of U.S. surveillance operations near the Chinese coast. Meanwhile, according to Reuters Rice told General Fan that China must halt its “dangerous intercepts” of U.S. surveillance flights. Despite the testy nature of their remarks, U.S. officials called the discussion “constructive” and said that China was taking U.S. concerns seriously. Officials also indicated that the two militaries are working on new confidence-building measures. In all the comments made during Rice’s meetings, the most interesting point may have been what she did not say. Chinese officials, as usual, placed a heavy emphasis on the “joint consensus” between Xi and Obama to build a “new model of major country relations” (also translated as a “new type of great power relations”). Tellingly, Rice did not mention the phrase, providing more evidence that the Obama administration is backing away from the Chinese-coined term. The Obama administration apparently feels that China’s interpretation of the phrase is too loaded. In the meeting between Rice and President Xi, reiterated his vision of a “new model of major country relations”: no conflict or confrontation, mutual respect, and win-win cooperation. Such a relationship is a “skyscraper,” Xi said, one that must be built up slowly once a foundation of “strategic trust” has been laid. The key to “strategic trust” is deeper mutual understanding and respect for each other’s “core interests.” In a briefing on Rice’s visit, Foreign Ministry spokesperson Hua Chunying emphasized that this “new type of relationship” must begin in the Asia-Pacific region, where U.S.-Chinese interests are most entangled and the two countries interact most frequently. On the surface, there’s nothing objectionable here. But as with much diplomatic speak, supposedly benign phrases can be fraught with meaning — and with potential land mines. For one thing, China’s condition of “mutual respect” translates in practice to a demand for increased U.S. respect for China. Beijing believes it has already done enough to show its respect for the U.S.; it’s the other side of the equation that’s missing. Second, Beijing’s emphasis on respect for its “core interests” implicitly demands altered U.S. positions on regional issues, including Taiwan (where arms sales are seen a major affront to China’s “core interest” in reunification) and the South China Sea (where China’s “indisputable sovereignty” is occasionally defined as a core interest). Finally, China’s particular focus on the Asia-Pacific region sends the message that this “new model of major country relations” implicitly involves U.S. respect for a Chinese sphere of interest in the region — something Washington is not ready to accept. The Obama administration has apparently decided that the Chinese definition of “new type major country relations” would require too many concessions from Washington. The Obama administration has an alternative definition, with an emphasis on “common interests” (read: U.S. interests where it seeks Chinese cooperation) rather than China’s “core interests.” As Evan Medeiros, the senior director for Asian affairs on the National Security Council, put it in an April interview with The Asahi Shimbun, “We have a clear idea of what the new model [of relationship] is about and what it is not.” Apparently, in an attempt to clearly differentiate its definition from China’s, the Obama administration has stopped using the term altogether.